This past week I have been hard at work testing the Vivax top and dress pattern from Sofilantjes. 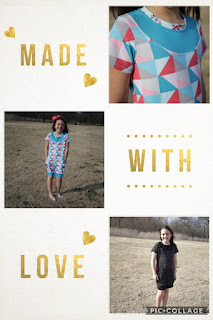 I made my 9 year old daughter two dresses, and I just loved how both turned out. Abby told me that they were both very fancy, and she has loved wearing them. The pattern can be made in a tunic or a dress and includes the option of a round flat neckline or a collar. There are also lots of sleeve color-blocking options. Both of the dresses I made have the round neck and are short sleeve in a size 10. The main fabric on the first dress is from the Idle Wild collection that released from Riley Blake several years ago. I bought this on Etsy and have had it in my stash for some time waiting on just the right project. The pocket detail is probably my favorite part of this pattern. I always love how well written the instructions are in Sofilantjes patterns. It made the details of this pattern very easy to do. I went slow when putting on the turquoise blue part of the neckline and was so happy to see it layed so nice and flat. My next dress is in a remnant that I found at Wherehouse fabric in Dallas. Abby is a big fan of cheetah print and was very excited about her next dress. She even wore her cheetah booties with it! I used black and pink solids for the binding and pockets. These solids are from Made Whimsy, who is definitely my favorite place to order solid fabric from. I can't believe my little girl is already 9. She really enjoys baking and is making brownies while I type this blogpost up. She is not only a great baker, but she made coffee this morning and brought it to my hubby in bed when she woke us up to go to church. Amazing! Those sleepless nights when she was a newborn were worth every moment. You can grab a copy of the Vivax pattern in English here. It is on sale now through Tuesday at 4:55 p.m. CST (23:55 CET). The pattern is also available in French and Dutch.